I wasn’t sure if I’d have enough wifi to blog on this trip, but I’m currently sitting in a cafe waiting for England to wake up before I can FaceTime so I thought I may as well write a wee post! In my first week, I basically made my way down the west coast from Negombo to Galle before taking the train back up to Kandy. 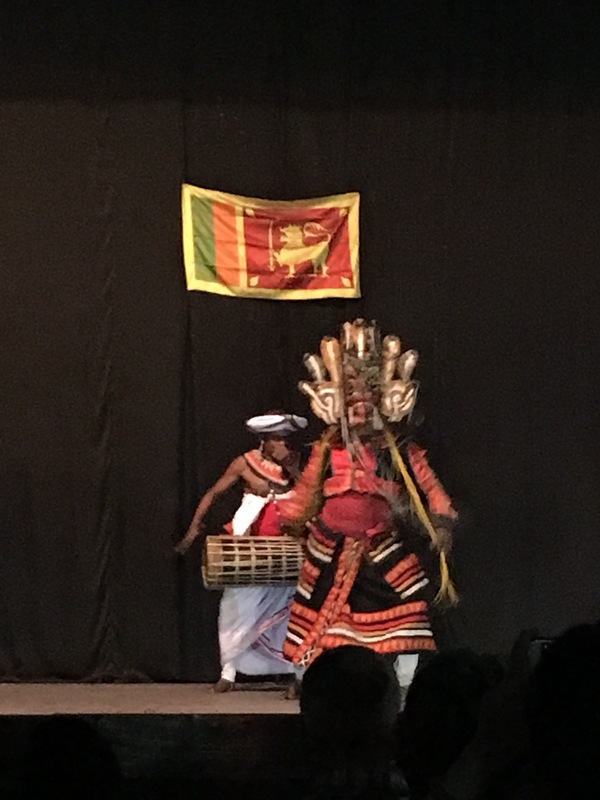 To hear about my time at the Galle Literary Festival, check out my other blog here. 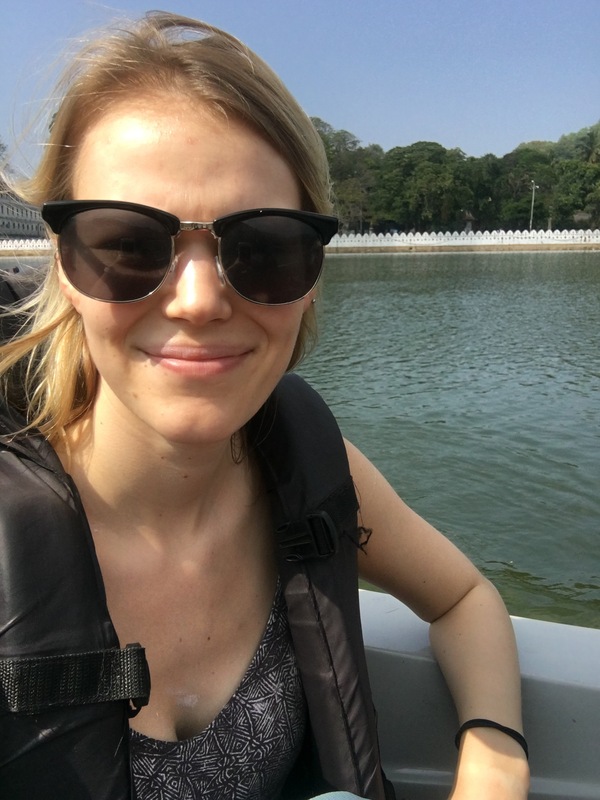 After this, I made my way to Kandy where I will be volunteering for the next few weeks. This was my first experience of the Sri Lankan train system and, while it was quite fun to sit on the floor by the door from Galle to Colombo, I didn’t particularly enjoy doing so with my massive rucksack and a throbbing headache. 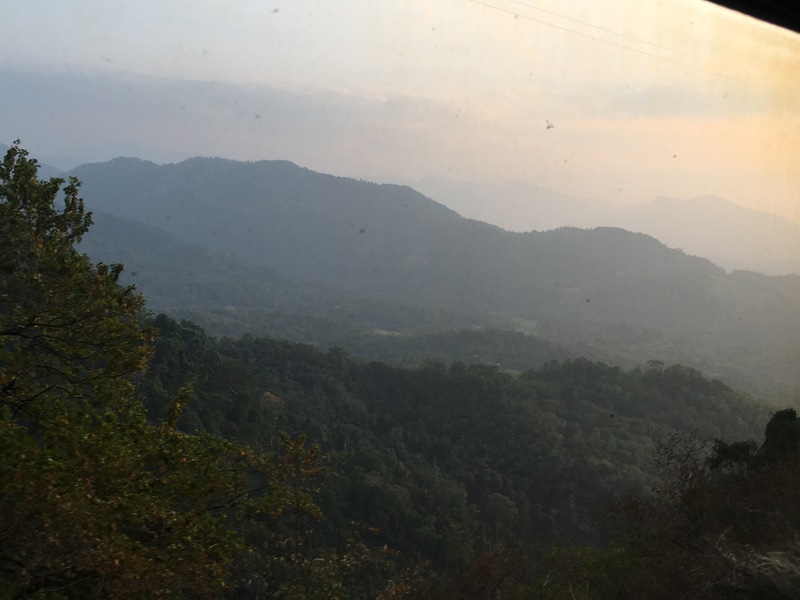 Fortunately, the train from Colombo to Kandy was much nicer and I was able to see the beautiful views as we travelled East into the Hill Country. 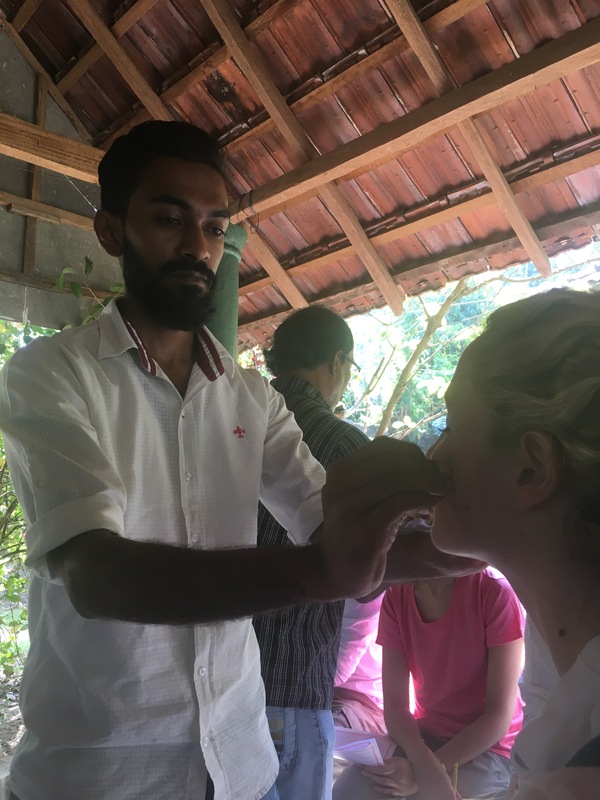 Here in Kandy, I will be doing a similar thing to what I did in Colombia and Ecuador – teaching English through a local organisation. We are put up in a volunteer house which is a lot busier than I’d anticipated. 28 new people arrived on the same day as me and so the house is bursting with eager volunteers from all over the world. Rather than going straight in with our projects, we took part in an orientation week for our first five days. 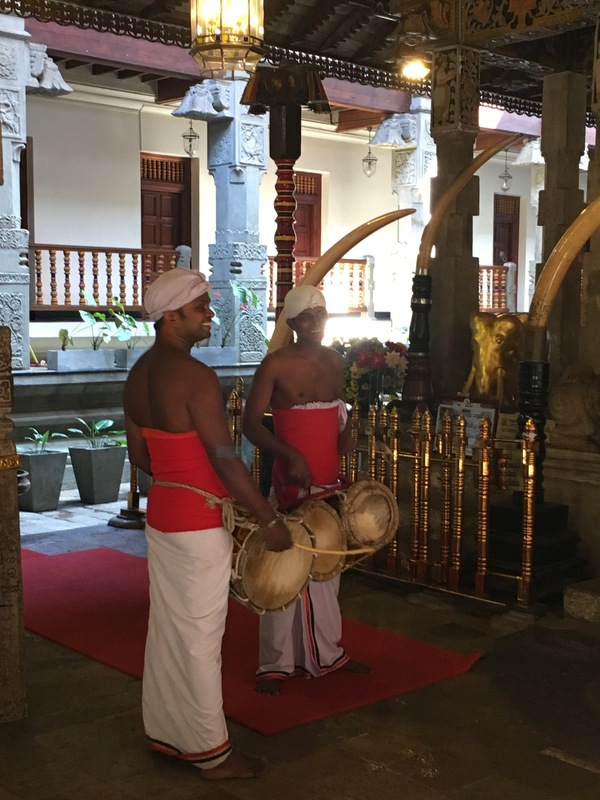 This was pretty full-on and absolutely exhausting, but it did provide a reasonably good introduction to Sri Lankan life and culture and an overview of all the best things to do and see in Kandy. It was also a great way to get to know the other volunteers before we all get stuck into our different projects. Monday morning was our official volunteer orientation, in which we were told about the many different projects we can do. I came here to teach English but I didn’t realise how flexible the organisation is and quite how many different projects there are. I have decided to change every week and try three separate projects, but I’m sure I’ll change my mind about which ones as time goes on. Tomorrow, I will start teaching local Buddhist monks. This is what I came here to do so it seems a sensible place to start, and I’m hoping it’ll be as rewarding as teaching in Colombia was. 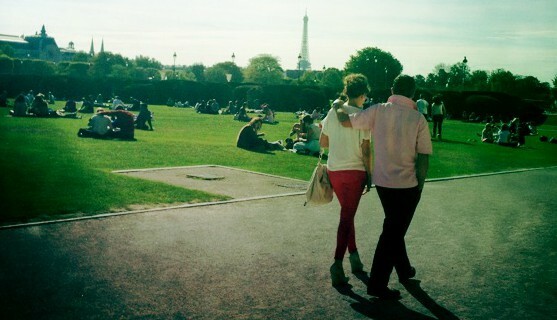 The rest of the week flew by, but I’ll try and write a little about what we did each day. 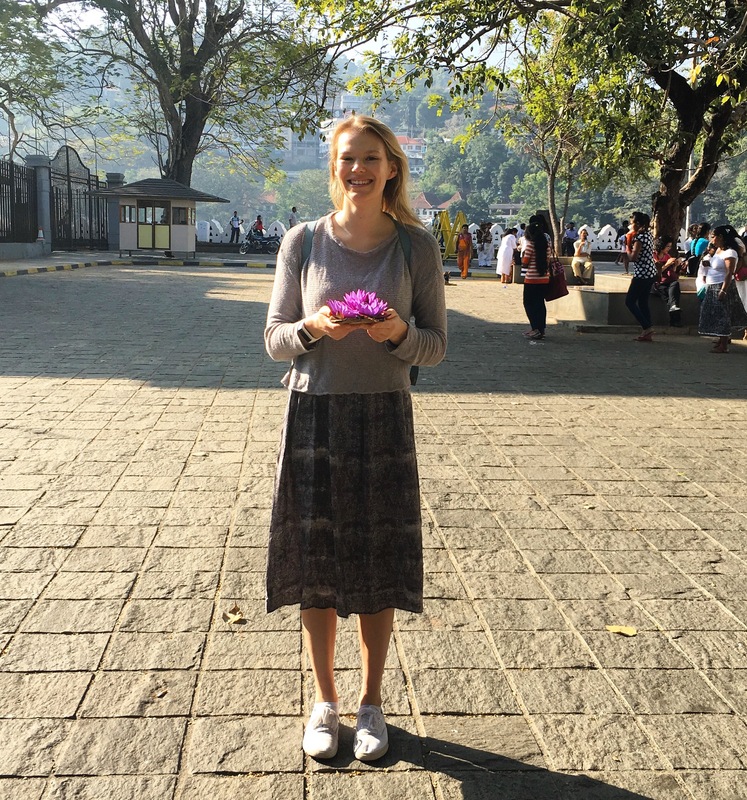 On Monday afternoon, we went into Kandy to see the city centre for the first time before watching a cultural show. 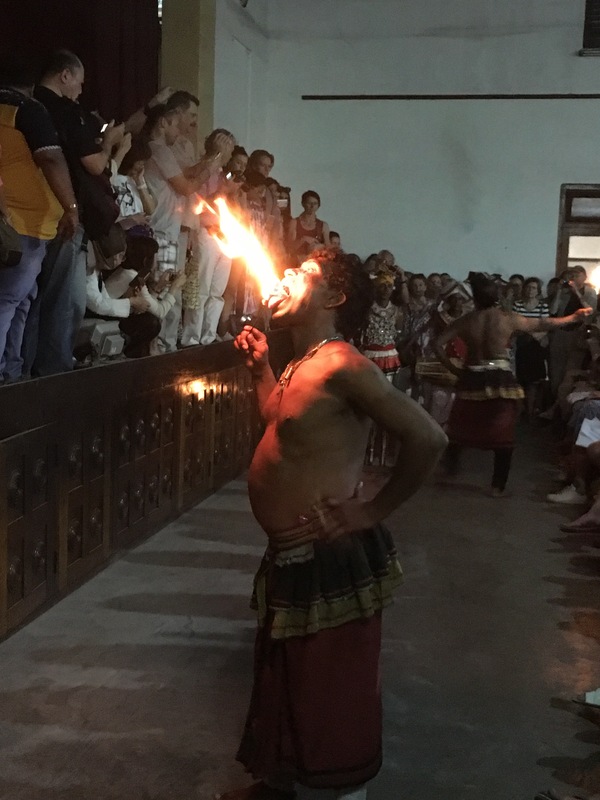 This mainly consisted of dancing and singing and ended with a fire-eating spectacle. 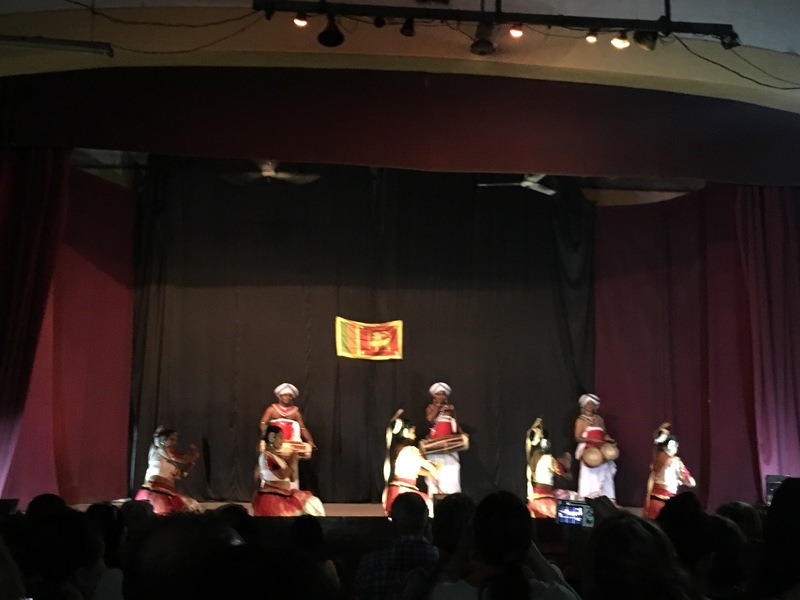 It was energetic and rather entertaining, butnid seen something similar in Galle already so I kind of knew what to expect. 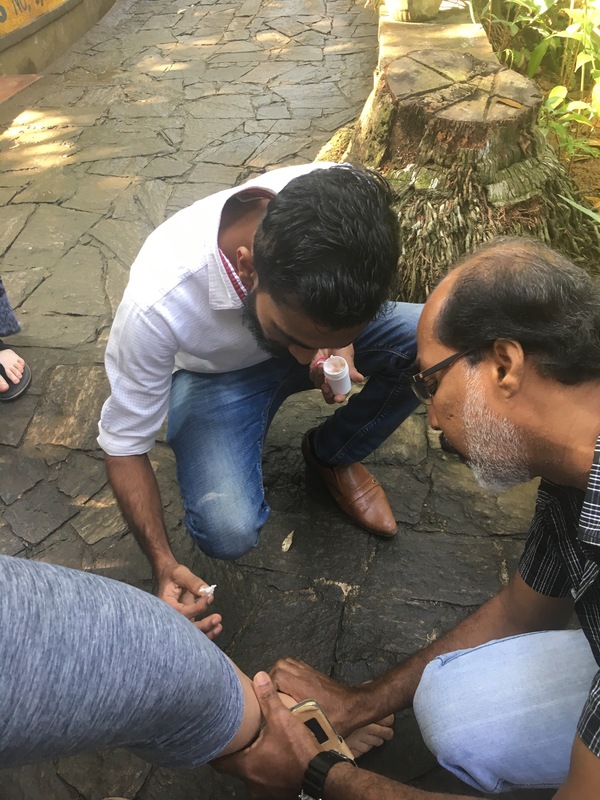 On Tuesday, we started with a visit to an Ayurvedic spice and herb garden. 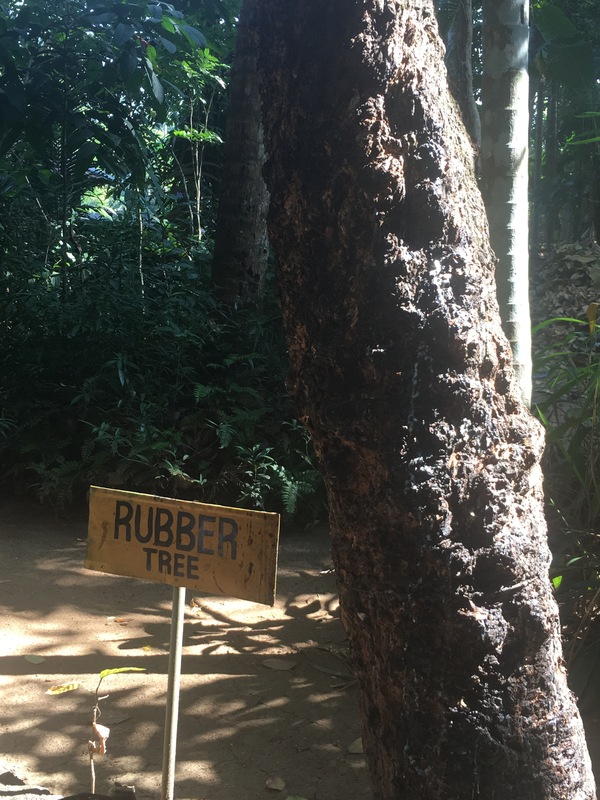 I was obviously fascinated by this and I took loads of notes about the beneficial properties of vanilla, cinnamon and sandalwood among many others. 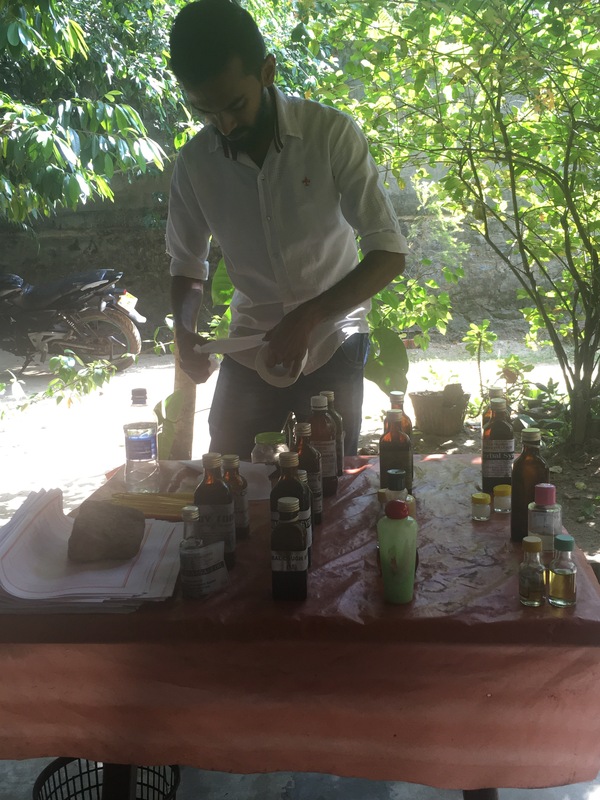 We drank a special spiced tea, were treated to neck and shoulder massages and were given a brief introduction into the science of Ayurveda. Applying some ‘magic’ hair removal cream to my friend’s leg. We then went to a tea factory where we learnt about the manufacturing process of Sri Lanka’s main export. The country is the second biggest producer of tea in the world (after India) and the greatest exporter. 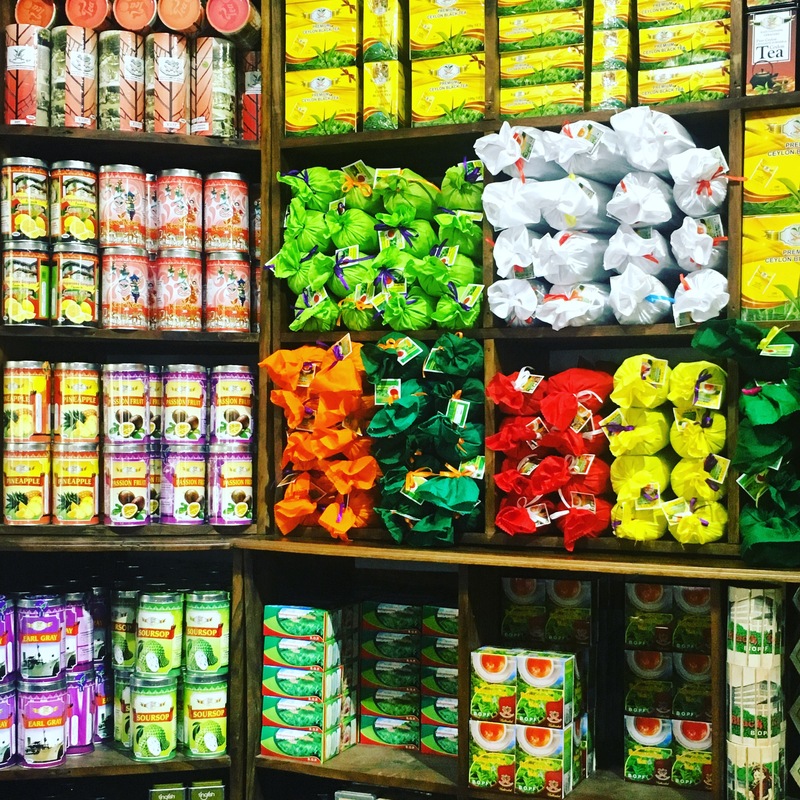 Sri Lanka has 1200 tea factories, all of which use the same production processes. We learnt that green and black tea are produced from the same leaves but by different processes, while golden and silver-tipped leaves are different plants which undergo the same process. Having just read Dinah Jefferies’ The Tea Planter’s Wife, I was particularly interested to see the process in action. Perhaps my favourite fact of the morning was that the word ‘tea’ stands for Tanin Enzyme Aroma. Who knew! 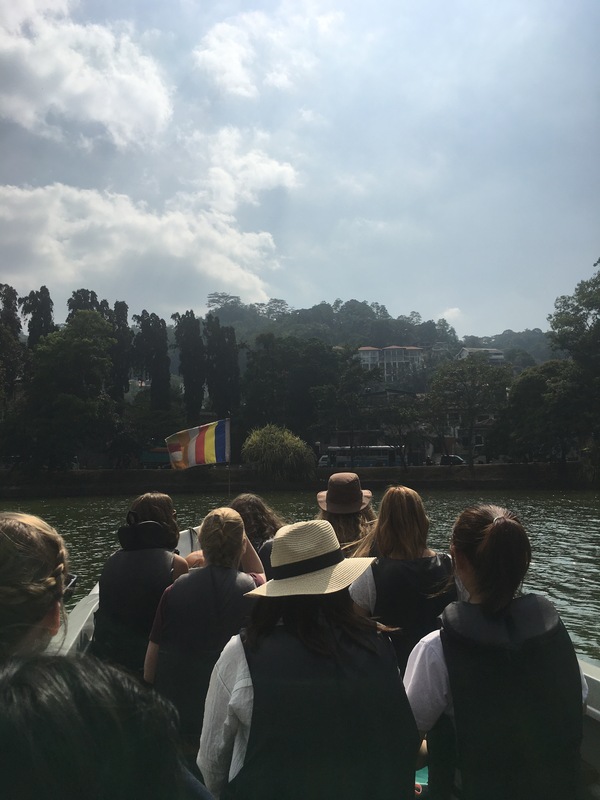 We then had lunch in Kandy before a boat ride on the city’s beautiful lake. Following this, we went to a gem factory to learn about the many stones produced in the country, most of which are different coloured sapphires. On Wednesday morning we were treated to a cooking class at our accommodation. It was not quite as hands-on or informative as the one I did a few days earlier in Unawatuna, but it was fun to see how dhal and coconut sambal are made again and then great to eat the finished products! 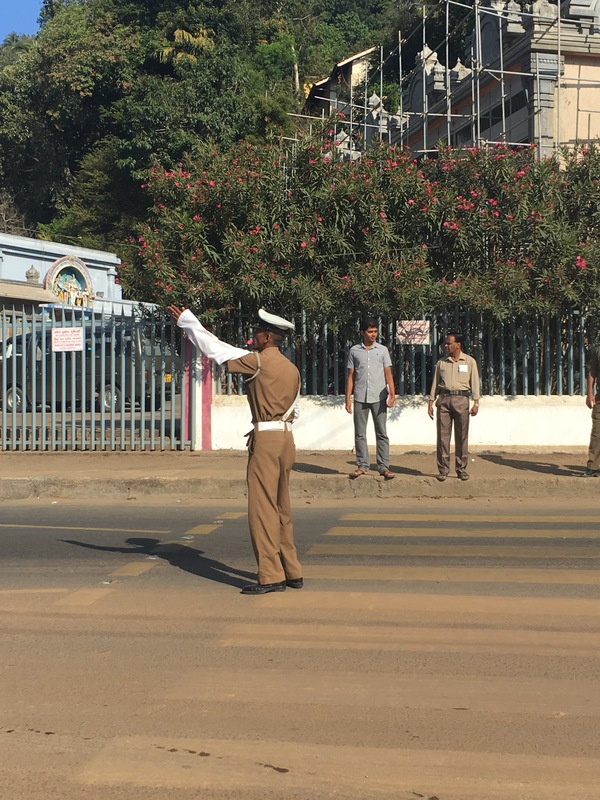 Some photos from the course I did in Unawatuna. 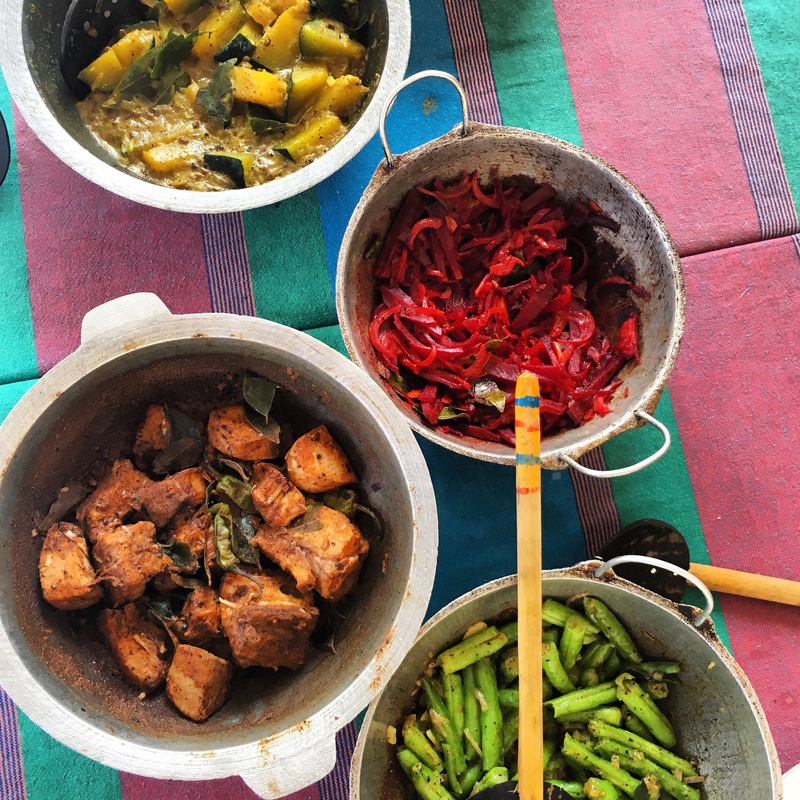 Our Kandy cooking class was slightly less colourful and varied! 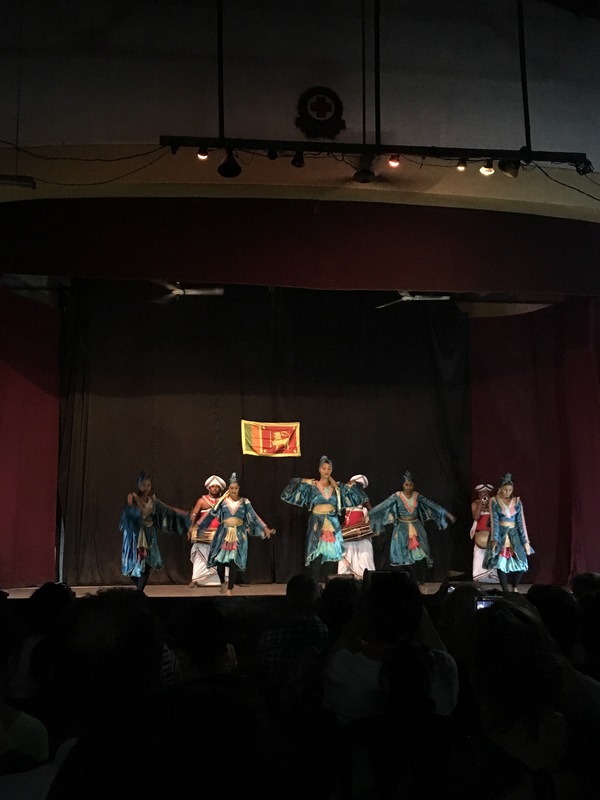 In the afternoon, we had a Sri Lankan culture lesson, which told us about a range of topics including arranged marriage, the country’s four national parks and the different flags. We then went to meet a Buddhist nun and learn about the religion and how monks and nuns live. They eat one meal a day and fast from 12pm until the following morning. They are not allowed to ask for food, but simply walk down the street with their special bowls in the hope that generous locals will give them a scoop of rice, dhal or curry. Perhaps the most interesting aspect of the monastic lifestyle is their rejection of the monetary system. 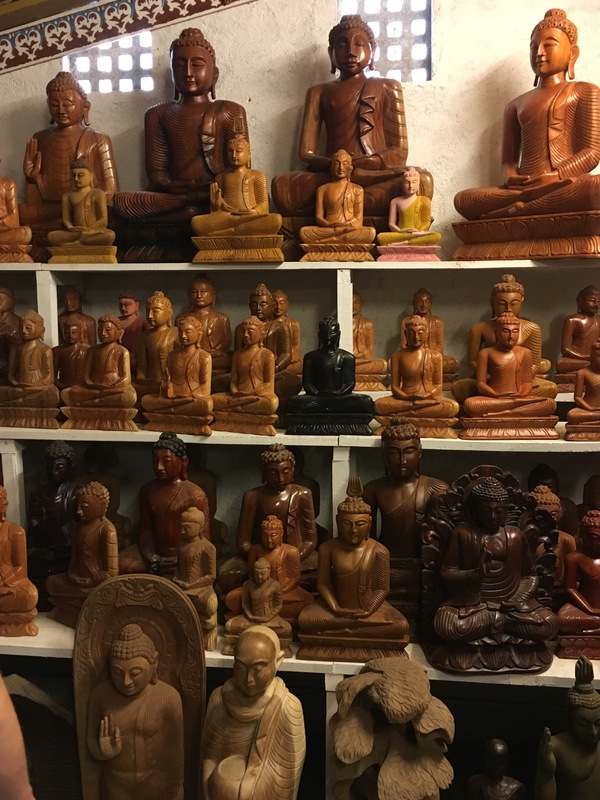 Buddhist monks and nuns do not use money, and so they have to rely on other people’s generosity in order to get anywhere or acquire material goods. The nun has a mobile phone but she is not allowed to ask people to top up her balance. Instead, she must wait until they realise it has run out and then offer to lend her a few rupees. We then meditated with the nun for 15 minutes or so which was interesting but more difficult than using my Headspace app! 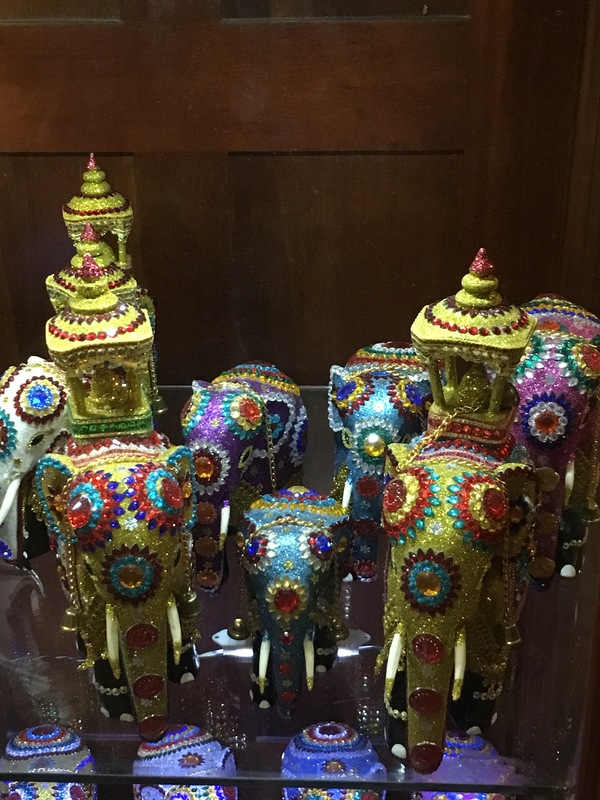 On Thursday morning we visited the Temple of the Tooth, Kandy’s main tourist spot. We bought pretty purple flowers to offer to the sacred tooth, and spent a while queuing before being herded through the temple at immense speed. It was a surprisingly chaotic experience for such a religious place, but I enjoyed the music and colour in the temple. It was certainly lovely! We then went to the museum of Buddhism and learnt about the different manifestations of the religion across the world. Following this, we went to a wood carving factory to learn about the different kinds of wood and the painting process. I was particularly interested to learn about the properties of rainbow wood, which can be mixed with various chemical substances to create different colours with which to paint. 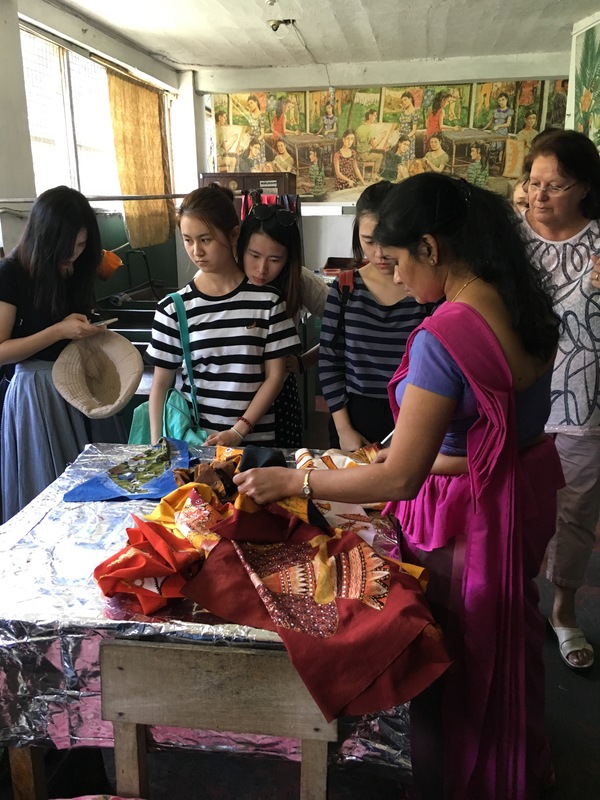 Finally, we went to a Batik factory to learn about the process of designing patterns on clothes and other materials. It is rather a slow process, consisting of painting cloth with wax before dying the whole sheet in order to leave the waxed areas white. This process is repeated many times, with the colour of the dye getting darker each time. The cloth is then placed in boiling water in order to melt the many layers of wax and thus leaving a multi-coloured picture on the cloth. For lunch, I went with my new group of friends to a restaurant called White House which is supposed to be one of the best places to eat in the city. We had a nice Indian meal for a good price, but I wouldn’t have said it was outstanding. 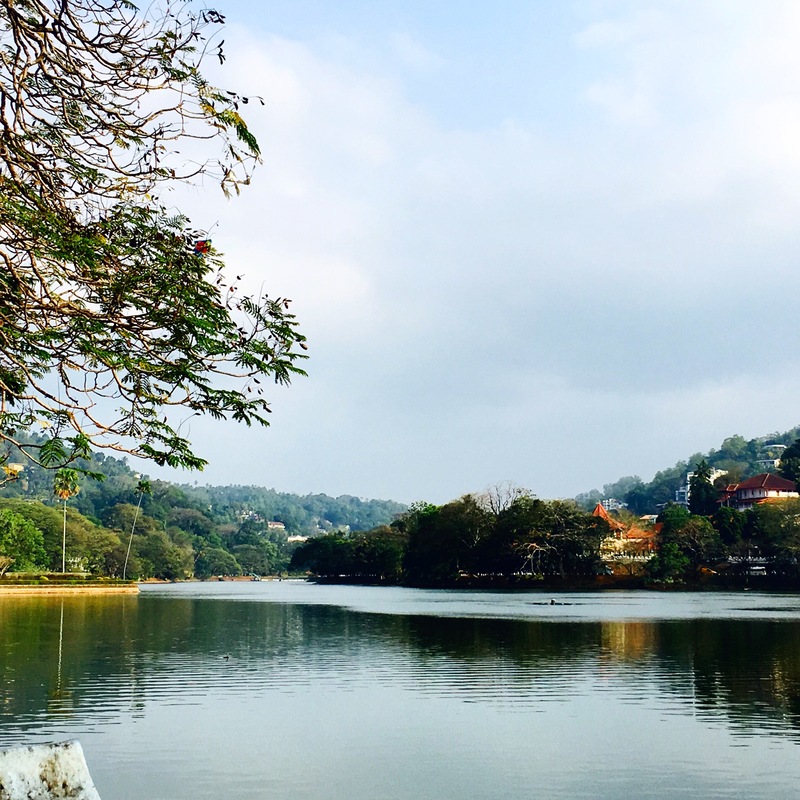 Kandy is different to how I would have imagined it, but it’s still a fun city to explore. On Friday morning, we climbed up to the White Buddha overlooking the city. 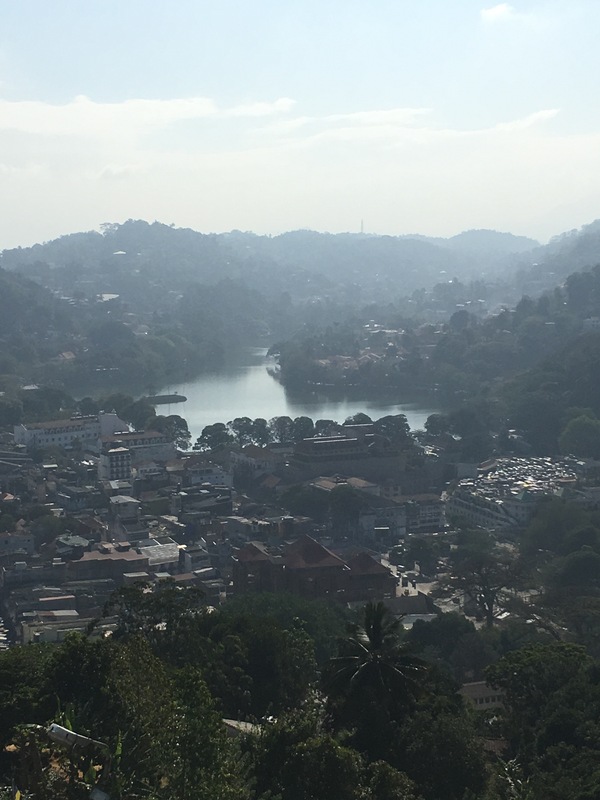 We got some pretty good views of Kandy and then met the chief monk from the temple up there. 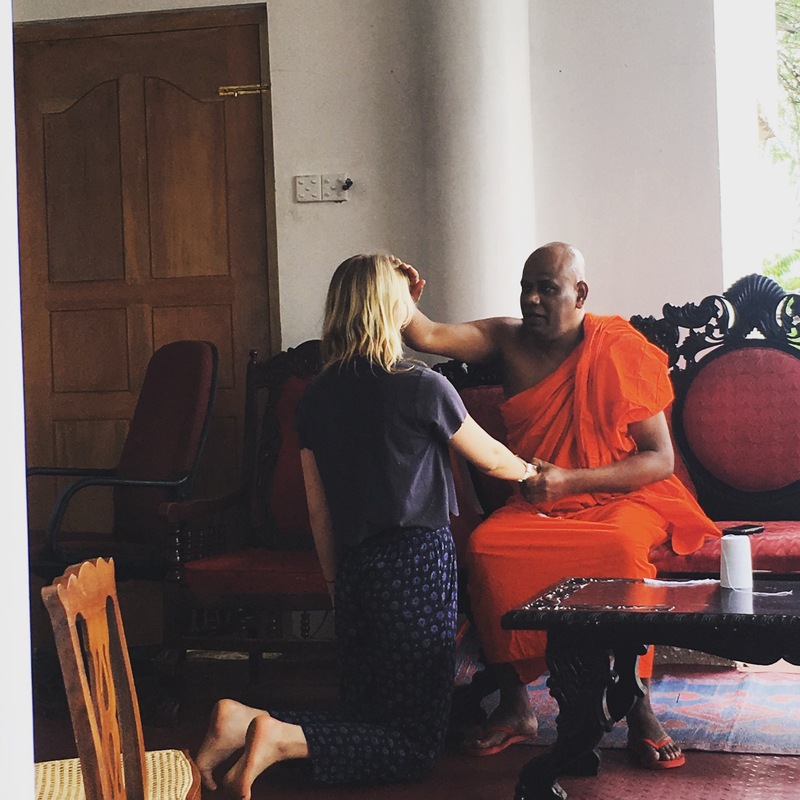 As we drank sweet tea, the monk blessed us all individually. I found it rather touching and will no doubt keep on my little white bracelet for a long time. We then went to a Hindu temple which was equally interesting. 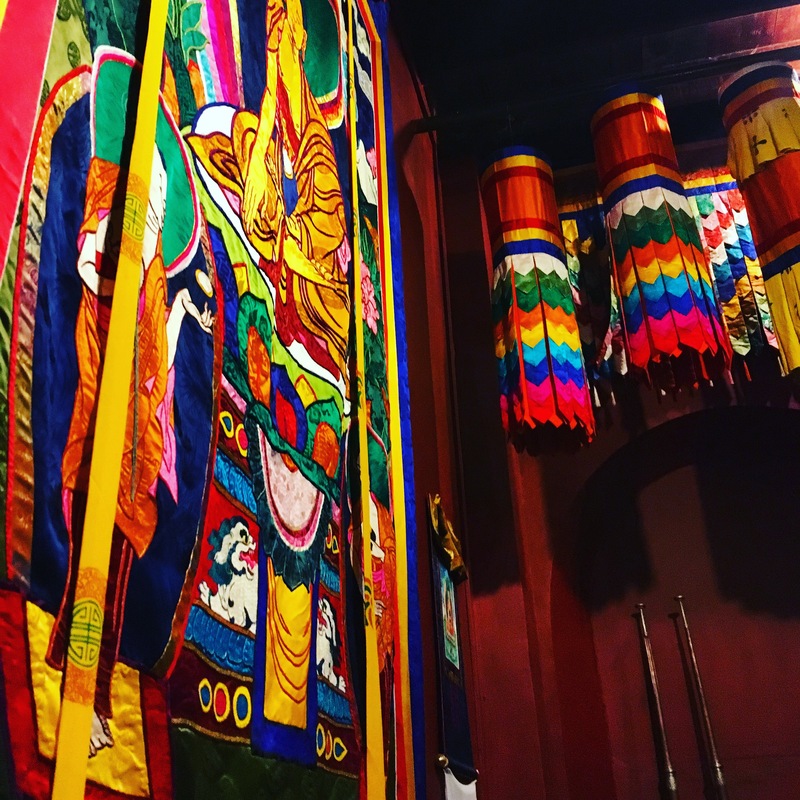 It was so colourful and I was somewhat surprised to see so many neon, LED pictures – it gave the temple a totally different feel to other places of worship I’ve visited. We went to an Indian restaurant for lunch, where we are our food with our hands for the first time. Slightly difficult when you can’t eat the bread that is usually used to scoop up the curry, but I enjoyed it nevertheless! The final stop on our orientation week was an Ayurvedic massage. I opted for a 20 minute back and shoulder massage which was quite pleasant but nothing extraordinary. It was still a treat to be offered this, though! Although I have some minor complaints about the orientation week – such as the fact that we were hereded from place to place like school children without much information about where we were going beforehand -, it was a really enjoyable five days and I am extremely grateful to Green Lion (the organisation I’m working for) for planning it all for us and for organising it reasonably well. 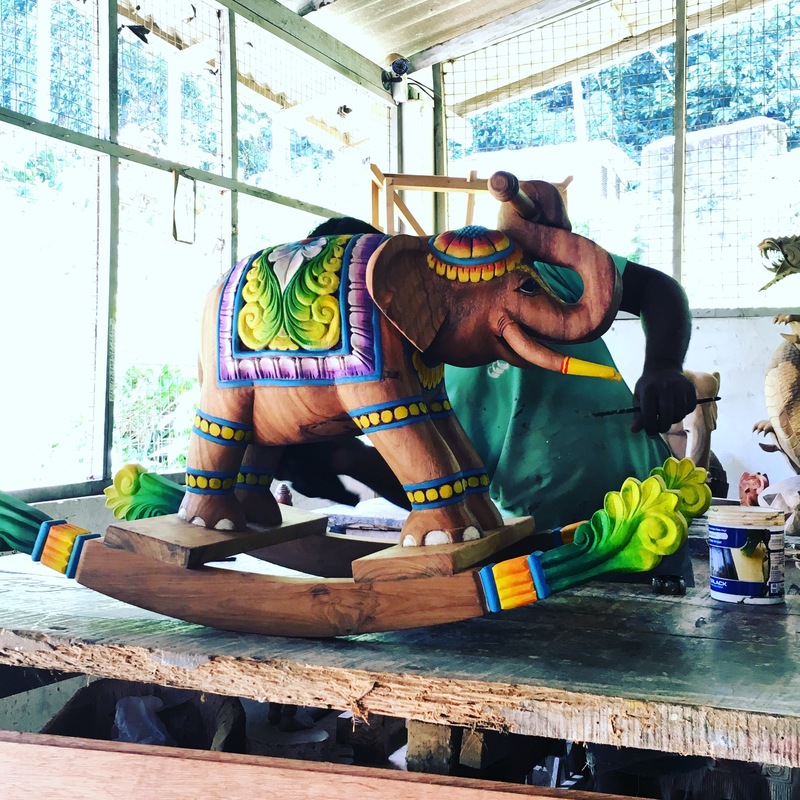 After a few days in Kandy, I’m only just starting to get my bearings and to figure out how to get around, but I’m sure it’ll come with time. I have started going for 20 minute runs around our apartment (which is in the middle of nowhere north of the city centre), but I’m still pretty unsure about directions so I tend to run back and forth in front of our driveway! To get to the cafe where I am right now – and get some functioning wifi- I had to get a local bus into town. From our house, it’s a 20 minute walk down to the Main Street where the supermarket is, followed by a 20 minute bus to the town centre. It’s not too difficult, but I wanted to do it myself to check I actually know where I am – after a week of total independence, I’m finding it a little hard to adjust to completely relying on the Green Lion staff to get me around! I have really enjoyed the last week but I’m looking forward to starting my placement tomorrow and meeting the little monks I’m going to be teaching. That’s what I’m really here for, after all!